On 1 May 2018, as a part of “Our Heritage Campaign” activities, the Maysan Social Forum held a special training about the risks that face the natural and cultural heritage in Maysan province. Salman Khairallah and Ahmad Salih Ni’ma, environmental activists, led the training and gave informative lectures on the issues involved. The training helped to build the capacities of young activists involved in the Maysan Social Forum, giving them the tools needed to create and implement effective campaigns. Participants discussed the drought and the threat it represents to the middle marshes. Because there is not enough water coming to these marshes, they are drying out and expected to disappear forever if direct action is not taken soon. The middle marshes are located in Nasiriyah, Al-Islah territory, and Ammara, Al-Salam territory, in a border area between the two provinces called Al-Qata’ territory. 93% of the area suffers from significant dehydration, thus a mere 7% of these precious marshes have the water they need. The Ministry of Water Resources is currently trying to provide enough water for the areas that lack it, both in Basra and more generally in the areas that Euphrates River goes through, by re-channeling water from the Tigris River. This has an immediate and dire impact on the water levels in the marshes and threatens their long term existence. Despite these high stakes, the local government in Maysan has taken almost no role in solving the problem — rather they have neglected their responsibilities and tried to push them off on the central government in Baghdad. The Tigris River is threatened still more by the Ilisu Dam, now being finished by the Turkish government. This big dam will dramatically impact Iraq’s access to resources from Tigris River, as it will control the water supply for the first time in history. It is expected that Turkey will start filling the Ilisu Dam soon, perhaps as soon as next June. Part of this training was dedicated to the preservation of the cultural heritage of Maysan Province. For instance, the city of Ammara has an enormous cultural and historical heritage, with nearly 460 archeological sites that have not yet been explored. Scientists and archaeologists suspect that there may be ruins from different civilizations, including: Elamite, Sumerian, Sasanian, and Parthian. Citizens of the city are trying to protect these sites, ensuring that they are explored in a systematic and professional way that will guarantee their safety. The province is also home to old professions that run the risk of disappearing if not deliberately protected and maintained, such as boat-building and textile-making for clothes and furniture. The young people who are working on the “Our Heritage Campaign” are trying to resurrect and protect these important aspects of the region’s heritage. At the end of the training, it was agreed that in 2018, the “Our Heritage Campaign” would focus on the preservation of the heritage of the Mesopotamian civilization and form a committee of 7 people, including Ahmed Salih Ni’ma, to be in charge of developing an action plan. This plan will target raising awareness about the risks now facing the natural and cultural heritage in Maysan province and ways to overcome them. This will include reaching out to local communities and heads of Maysan tribes to orient public opinion towards the issues the region faces, and pressuring the central government in Baghdad to make some policies that support their goals. There were twelve participants in the training including two women. They represented voluntary teams and civil society organizations working together within the Maysan Social Forum. Some examples of these teams are: Youth Gathering of Freedom and Peace, the Himam team, the Sumer Humanitarian Organization, Prosperity Gathering, the Light of the Future team, the Friends team and the Misha Organization. “Our Heritage Campaign” is a civil society campaign launched by Maysan Social Forum in 2017 in cooperation with the Iraqi Social Forum. It aims to orient public opinion in Maysan province towards protecting its natural and cultural heritage. This campaign comes within a wider program for social cohesion under the name of “Paths of Coexistence in Mesopotamia” which covers different Iraqi cities and provinces. 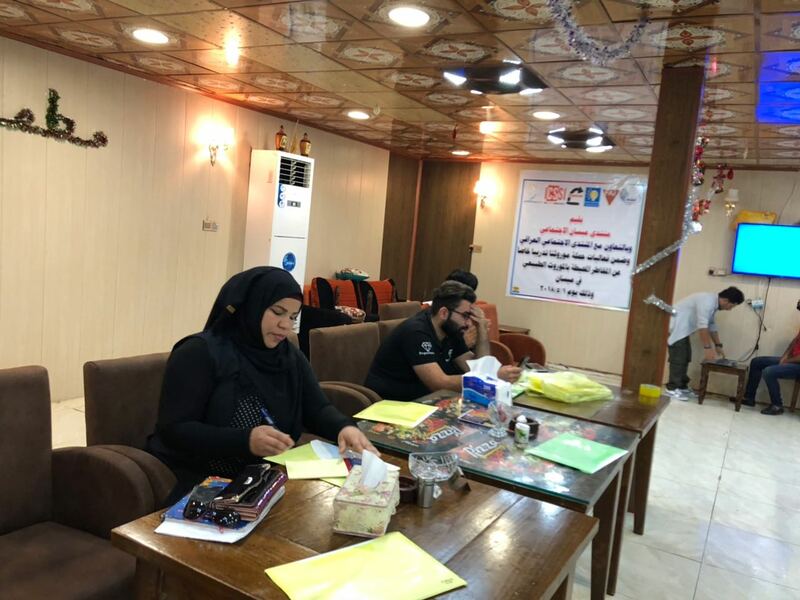 This program is operated by the Iraqi Social Forum and the Information Center for Research and Development, in partnership with the Iraqi Civil Society Solidarity Initiative and Un Ponte Per organization, with the support of the Swiss FAI Organization.